How many Wedding Receptions do you have a day? We only host one wedding Reception per day, whether your Reception is a full day or half day, we only host yours. What is included in the Exclusivity Fee? The Exclusivity fee is our Venue hire fee, you will have use of the Main House, Gardens, Grounds & Banquet Hall all day, generally from midday on your chosen date until 10.30am check out the following day, also we do not charge any additional set up fee for Civil Ceremonies. Also included is the Bridal Suite & the 2 further premium rooms in Blakelands House. Are there any other costs we need to know about? Very few, and all of them are for extras you might want to add such as Canapés, chair covers, etc. Is there a minimum number for a wedding? No, you can have any size wedding on any available date. our Exclusivity Fee is a fixed charge every day of the year except for saturdays during May to September. during these months, and only on Saturdays, the charge does vary depending on the number of adult guests attending. these charges are detailed on page 5 of our wedding literature. Is there a Master of Ceremonies? All of our catering is done on site, we employ our own team of Chefs & Waiting staff, who are all experienced in Catering to & serving large banquets. Our kitchens are awarded a 5 Star hygiene rating from South Staffordshire Council, we are proud to have held this award since they were first introduced. What bars are available on our day? The Lodge Bar will open 1 hour before your civil ceremony, the bar will then close during the ceremony and reopen after reception drinks. If arriving from church, the bars will open after reception drinks are served. This bar will then stay open until we sit. The Maltings Bar will open after the first pouring of wine. The bar will then call last orders at 11:45pm and all bars will close at 12pm. What time are the bedrooms available? The Corbett Suite & House Rooms are ready from midday. The other guest rooms are available for checking in from 1.00pm. Early arrival packages can be requested, subject to availability. Do you have any suggestions for suppliers such as florists & cakes? Yes, under our wedding menu heading there is a Wedding Shopping section, everything you need for complete your wedding is there, also no one listed is paying us a fee or commission to be there & we have worked with everyone of them in the past & have no hesitation in recommending them to you, many of them will also offer you a discount as you are having your wedding at Blakelands, just look for the Partners Logo next to their listing. This, of course depends very much on what you want, but there is a very handy calculator in the wedding section to help you work this out or if you prefer, simply email us the numbers for day & evening, the likely date you are thinking of & we can work out a guide for you. We also offer fixed price All Inclusive Wedding Packages including all your food, wines, linen, top table flowers & supper. The Cost Calculator & the Wedding literature mention a Buffet Set up Charge, do I have to pay this? This charge only applies if you are having a buffet only, either to replace your main meal or as your only food service & you want a formal seating plan with namecards, cutlery, napkins etc put on the tables. if you are having an evening buffet following a sit down meal or just an evening buffet, this charge doesn’t apply. Can we see Blakelands prepared for a wedding? As you would expect on your Wedding Day, we don’t permit anyone to view Blakelands on an actual wedding day, however, we do hold 2 Open Days each year, Spring & Autumn, when we will dress Blakelands as on a wedding day for you to visit, on these days you will have access to all areas, all our bedrooms, gardens & grounds. We also hold wine tastings on these days to give you an opportunity to taste our wines. When can we arrive at Blakelands? 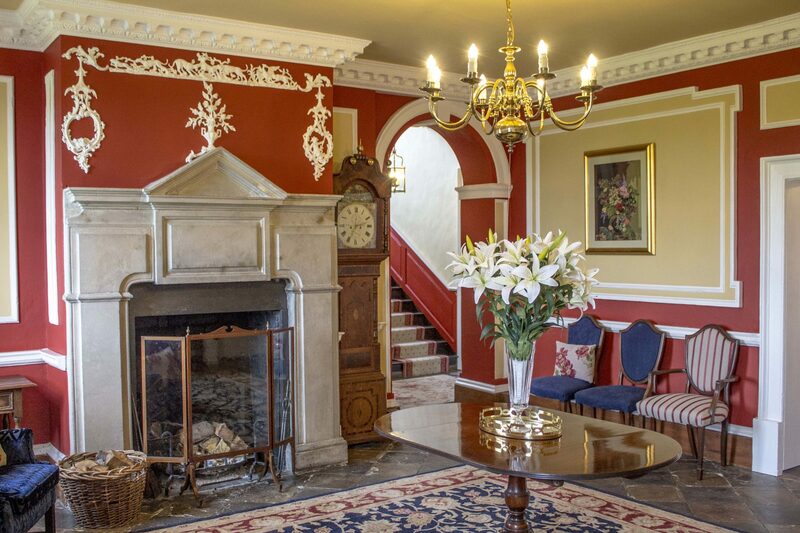 The Corbett Suite & House Rooms are ready from midday for the Bride & attendants to arrive & prepare for the Wedding, the other guest rooms are all available for checking in from 1.oopm & the Bar opens 1 hour before your Civil Ceremony for guest arrivals. Early arrival packages are also available, subject to us not hosting a wedding on the day prior to yours. I’m doing my own table decorations, do I have to set them out? No, we’re happy to put out all your table settings for you, but we do ask they are table ready & we don’t have to construct them or remove any wrapping or packagings from them. I have booked the Inclusive Package, who can do my top table flower arrangement? Only Flowers by Andrew or Clare’s Weddings can provide your top table flower arrangement for you. Their contact details can be found on our wedding suppliers page. Are there any restrictions on what I can have on the tables? We ask that all tealights come with a suitable holder and all sprinkles for the table are flat, such as no balls or diamond shapes as they become a trip or slip hazard and can hurt bare feet. Please be conscious that we shall require space for food service, but other than this you can have whatever you wish. When do we have to confirm a booking? When you are ready. After viewing, we will provisionally hold your preferred date initially for 2 weeks while you make your decisions. only when you are ready will you be asked to complete a booking form & pay a deposit. Do we have to Clear up at the end of the night? No, after you have all departed to your rooms, we will clear all your belongings, table decorations, etc to one room ready for you to collect when you depart the following morning. Can my Buffet served outside? There are Fairy Lights on the beams in the barn, will these be on on my day? There is bunting on the top end of the Barn, can this be hung on the rest of the barn? What favors/ guest gifts can I have for the tables? You can have anything that you can imagine but we have to consider the practicalities, such as space, suitability and safety. Any alcoholic favors must be no larger than 25ml and unfortunately, we aim to make Blakelands a nut-free environment, so we cannot accept favors that contain nuts. You say you maintain a ‘nut free environment’ at Blakelands, what does this mean? Due to the risks for nut allergy sufferers, we maintain a nut free environment at Blakelands, this means we do not accept any products that contain nuts. Items that say ‘may contain traces’ are fine and we ask that this is adhered to throughout the whole site, we however, do make an exception for wedding cakes. Yes, normal candles can be used and lit in the main room, however, electric candles will need to be used in the other areas of the venue as they are not always monitored. What time can suppliers arrive on my day? Suppliers to dress the room can arrive from 10:30am on the day of your wedding and must have collected everything by 10:30am the next day. Yes, however, it must be biodegradable and in selected areas of the venue. We also recommend soft and pale colours as bright coloured confetti can stain your wedding dress if it rains. Can I bring my dress the day before the wedding? How many people can sit round a table? We recommend 8-10, but if needed the tables can seat a maximum of 11 people, we also recommend that high chairs go on the wall end of the tables. Is there a sound limiter at your venue? No, there are no sound limiters, only your Grandma, she might have something to say about it when it gets too loud! My photographer is asking me to provide food, what are my options? If specified, we offer sandwiches and beverages to photographers while you are having your meal. There is the Red Lion Inn which is a 2-minute drive away just in the village. A Premier Inn in Kingswinford, which is a 10-minute drive from the venue. No, we work in conjunction with two caterers to provide some of the Street Food Evening options available. Can you cater for other dietary requirements? We can cater for all dietary requirements, including Vegan, Gluten Free, Dairy Free, Diabetic, Chron’s Disease, Pescatarians, Vegetarians, religious needs, allergy requirements and fussy eaters.